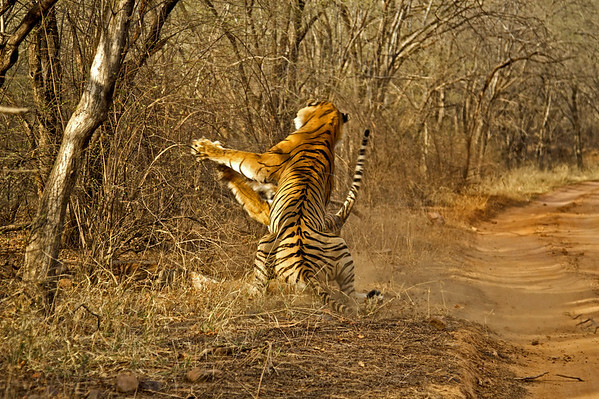 On the 24th of April 2009, Machali (Ranthambhore’s most famous tigress) and B2 (Bandhavgarh’s most famous tiger) were given a “life time achievement award” by TOFT in Delhi. 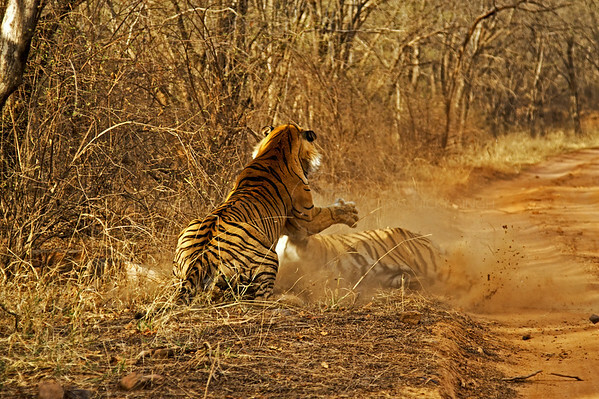 TOFT or Travel Operators for Tigers is a pressure group of Travel Operators (http://www.toftindia.org/index.php), Destination management companies and Accommodation providers who aim to make wildlife tourism in India more responsible. TOFT estimated that Machali contributed about US $ 10 million per annum for the last 10 years to the local economy in Ranthambhore, while B2 contributed over US $ 7.5 million per annum to Bandhavgarh’s economy. This is their contribution to the local economy and I for one believe that these are very conservative estimates. Their overall contribution to the Indian economy is far more than this maybe even three or four times more than this. Are such awards just a gimmick or do they help? I got a lot of flank from “net activists” that this a pure gimmick and that I should not be involved in such activities. I am involved and totally support such awards. They tend to increase the profile of the individual tiger and their park, which straight away means more and better protection. Such awards also give a much-needed boost to the morale of the staff working in the park. Right now most of the officials working in Ranthambhore are on cloud nine and I sure the guards in Bandhavgarh are as thrilled. Generally speaking, unknown tigers usually die an unknown and premature death while the known ones tend to live out their natural life. I do not know much about Bandhavgarh, so I will let someone else blog about B2 but I do know Machali. Machali and I came to Ranthambhore about the same time. What I mean is that when I moved permanently to Ranthambhore in 1998, Machali was a cub – the dominant one out of a litter of three females. 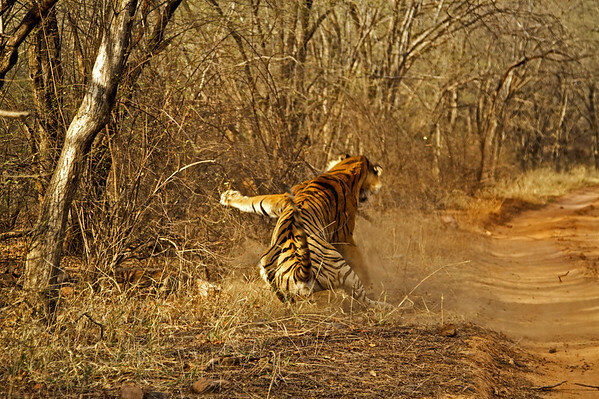 In early 1999 she took over the area of the lakes in Ranthambhore and has stayed there since then. 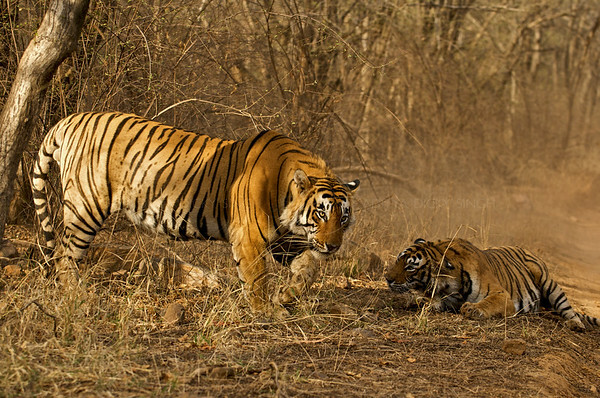 She sired four litters and two of the three tigers that were relocated to Sariska tiger reserve are her offspring’s (so much for mixing the gene pool in Sariska). About three years ago she lost most of her canines but that did not stop her from giving birth to and raising a litter of three females. She is now old and I am not too sure if she will live for much longer. She has only half a canine left, her territory has shrunk and she rarely goes near the lakes any more. The lakes are now part of the territory of her dominant cub from the last litter. In the end of March she killed a large male Sambar deer in a narrow valley (Bhoot Khurra) in the heart of Ranthambhore national park. Two days later a male (that we call Star male or T 28) snatched her kill and a few hours after that the to of them had a fight. We were fortunate to be in the right place when the fight happened. The Star male is young and at his peak but Machali held her ground. Though just a year ago this male would not have had a chance against her. This was on the evening of 1st of April 2009 (April fool’s day) but I am not trying to pull a fast one on you. See the pictures below. After the fight Machali gets all submissive while the male walks off. I believe it is good that both Tigers have been given the awards,as you have rightly said that I am sure they have brought even more revenue than has been spoken about.B2 in Bandhavgarh is 12 years old now,he did have a fight with Bokha this time last year.He still commands a large area,though he has a few scars,also slower in his patrolling,though he is still strong.I am hoping he will have a natural ending as did CHARGER IN 2000.Tourism has a part to play in helping stopping poaching,it would be great to see the parks open year round,I know this might be difficult due to tracks and terrain being affected,this though is sortable.Looking forward to being in India in November. This is an amzing piece of news and photogrpahy!!!! whats wrong with an award to a particular tiger? sometimes species need mascots, forerunners……. 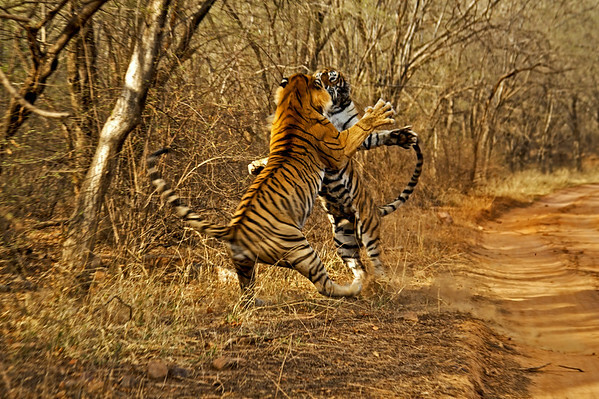 if machali is for the tigers of ranthambore, nothing wrong with that! also i completely agree with what an award does to the motivation levels and helping with protection. very cool i think the awards are a great idea. One day i hope to make it to the park and hopefully these amazing animals are still around. Greetings for the day,I am a passionate follower of yours,really great task done by you.Just wanted to know about the 2 tiger cub news of 4 days back.Also I want to visit the park,please tell me about what is the process for visiting the park.Also please tell about the exact headcount of the tigers in the park.I really love this animal. Machli is undoubtedly going to be a legend in history of wildlife.Read the article in Open journal.So sad to know that its dying. yes i too saw the whole story described by u on national geographic channel…it was really gd to see…i think this is the best tourist familiar tiger reserve forest in INDIA…n u r really doing a great job…!!! !wish to stay at ur camp…!! that must be awesome as it is made by a true nature lover..!!! I started an article on machali in tamil wikipedia. We need some photos of machali under GNU license. could you please help us ? Hope you will reply soon. Thanks. Brilliant pics. You are doing a fabulous job. Hoping that the RTR core area increases in the coming future, so that the big cats have their much needed wild and free space. The pics are really amazing. One need to be at the right place at the right time. I visited the park 2 days ago (June 12, 2011) and was delighted to get a sight of “Machali” resting near the small lake for a good 30 min. She still doesn’t look a 16 year old tigeress, she looks very young and still the most beautiful creature in the world of tiger. Long live Machali. I have been to Ranthbore National Park 21 st and 22nd June 2012. And was delighted to see T6 and T17. This was my first visit to the wild life, and will cherish it for long time. 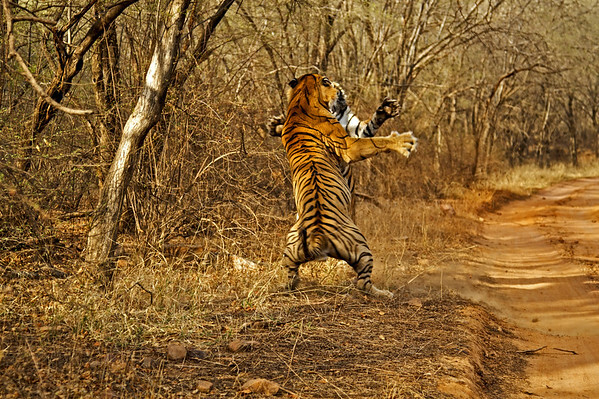 I am been lucky to see some of your amazing work in “THE RANTHAMBHORE BAGH” during my stay there, Hope to see more of it.